A RUP LIFE: The Swan Princess: Princess Tomorrow, Pirate Today DVD Giveaway!!! 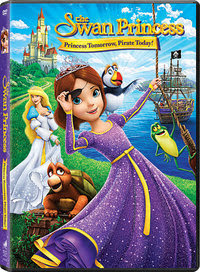 The Swan Princess: Princess Tomorrow, Pirate Today DVD Giveaway!!! ARupLife.com received product, press or compensation to facilitate this review. This post may contain affiliate links. We only give our honest opinions of products. This post is in accordance with the FTC 10 CFR, Part 255 concerning the use, endorsements or testimonials in advertising. * Each household is only eligible to win The Swan Princess: Princess Tomorrow, Pirate Today! DVD via blog reviews and giveaways. Only one entrant per mailing address per giveaway. If you have won the same prize on another blog, you will not be eligible to win it again. Winner is subject to eligibility verification. Took the quiz and I'm fit to be a pirate! I'm sure that I would be a princess! I'm fit to be a princess.